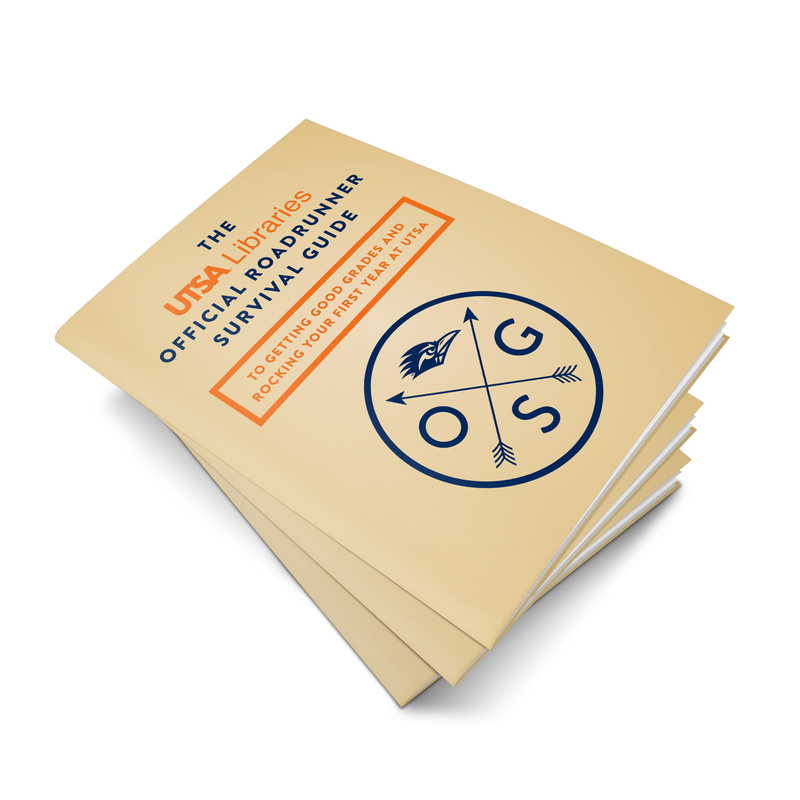 “Every summer we’re challenged to find the best way to engage incoming UTSA students during New Student Orientation. Because the orientation schedule is so dense, our face time with students is extremely limited – consisting of a 5-minute library stop on their campus tour and a table presence at a campus information fair. We had to find a way to make a lasting impression with our new students and keep the UTSA Libraries top of mind long after orientation was over. The piece needed to be highly readable and appealing to students, while familiarizing them with the many essential services and resources the library has to offer. 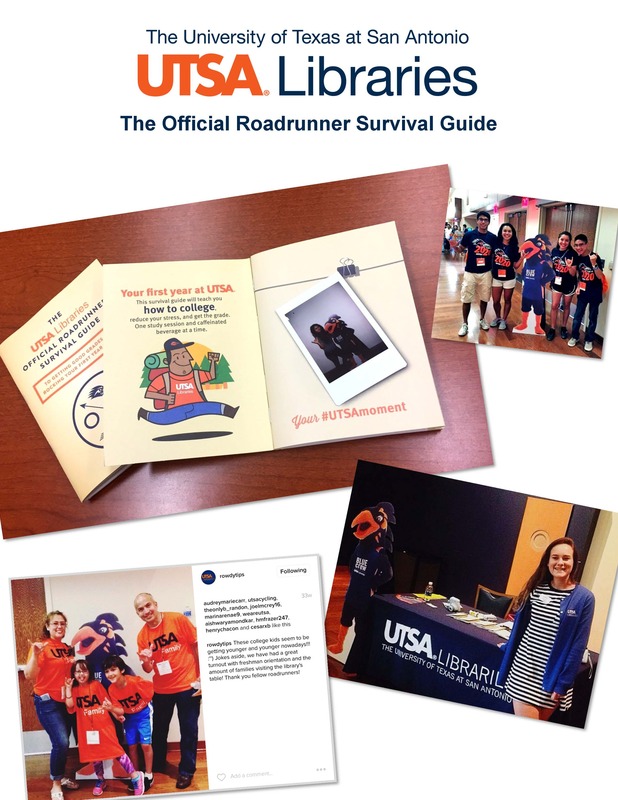 The result was THE UTSA LIBRARIES OFFICIAL ROADRUNNER SURVIVAL GUIDE TO GETTING GOOD GRADES AND ROCKING YOUR FIRST YEAR AT UTSA, which debuted in the summer of 2016. To engage our incoming undergraduates, we designed an interactive experience around the guide and offered an opportunity to create a personalized souvenir. Given our “selfie generation” audience, we decided to include a frame outline in the inside front cover spread for an instant photo. When students visited the library’s table at the information fair, we offered to take a Polaroid photo of them with a cardboard stand-up of our mascot Rowdy (dressed in a Blue Crew shirt – the same shirts worn by library staff). The photo was taped onto the designated spot to create a keepsake and a memorable #UTSAmoment. 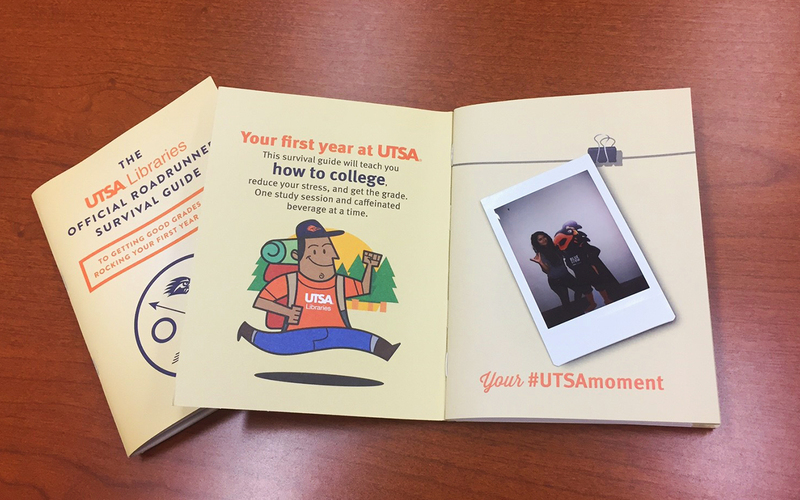 To develop the guide’s content, we spoke with current UTSA students to find out what they wish they’d known in their first semester. As a result, the guide goes far beyond library essentials to include a wide range of tips and insider information on “how to college.” We extended the Survival Guide theme further by creating a companion video (below) that was included in the online pre-orientation taken by all incoming students. During the first week of the semester, we offered an app-driven Survival Scavenger Hunt in our main library attended by over 150 students. By using the theme consistently, we emphasized that the UTSA Libraries are key to surviving the university experience. This project won in the category of Patron Orientation Materials, Print; $10,000,000 – $15,000,000 at the 2017 PR Xchange Awards. View the full listing of award winners.